Will I come back here thyme and thyme again? Much to Wicket’s horror I’m not a huge fan of Christmas. It’s not that I have anything against it, I just never got into the swing of celebrating a traditional Christmas with all the trimmings. Even so, I ended up having a Christmas dinner of sorts a few days before the 25th with Mondeo Man, NyanMaru and the Gunner at About Thyme, a hard-to-categorise restaurant that’s a short walk from Victoria station. The food has some Spanish hints to it, but it’s mostly the safe sort of Modern European grub that wouldn’t look out of place in a food pub. 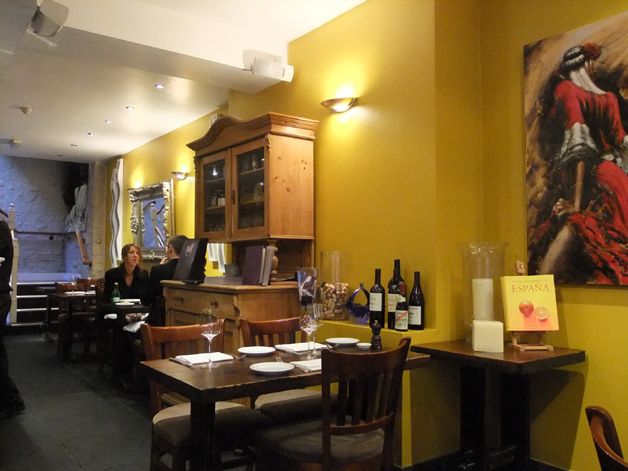 The decor is rather non-descript with some kitschy Spanish knick knacks on the walls, but service was friendly and efficient – just the way it should be. Exposed brick walls and a painting of a flamenco dancer. Why not? 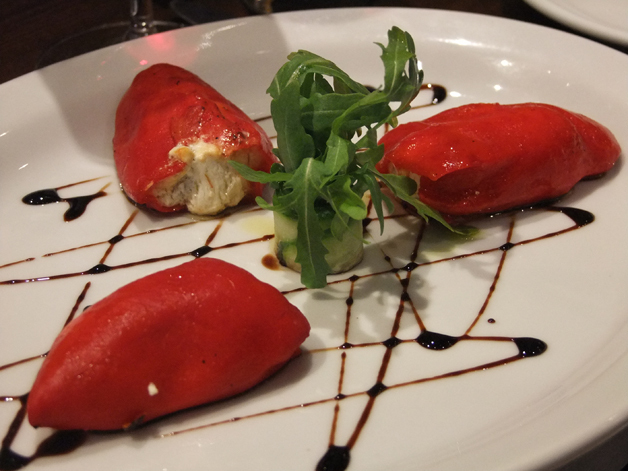 Mondeo Man has a fondness of Spanish-style food so it’s no surprise that he started off with the piquillo peppers stuffed with goats cheese and wild mushrooms. It was clearly too much for his palate though as he thought the filling was too rich, but he enjoyed the juicy, sweet and soft peppers. Mondeo Man always did enjoy a good stuffing! 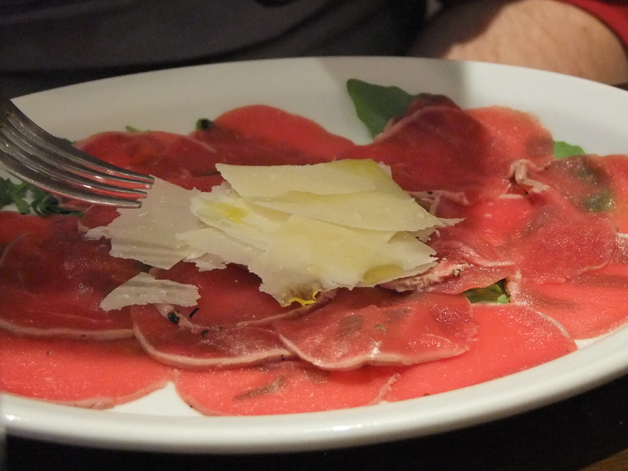 After some dithering, NyanMaru chose the wafer thin slices of beef as his starter. Although tender, he wasn’t impressed with the rather bland taste and he wasn’t amused by how easily the raw, extremely thin slices fell apart. So thin that it breaks apart at the merest touch. 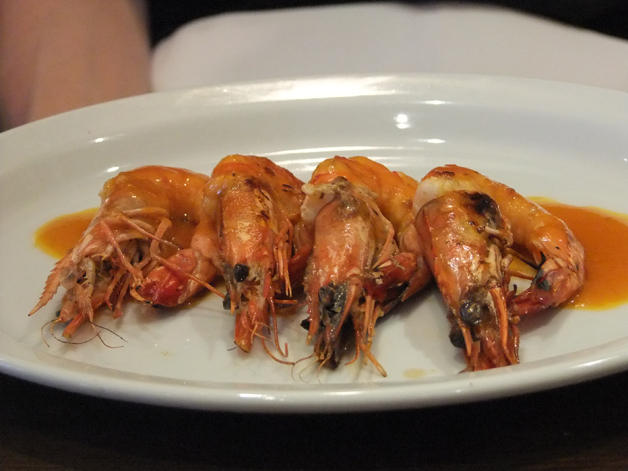 I would never have placed the Gunner as a seafood fan, but he wolfed down the sautéed tiger prawns quite happily. He enjoyed their firm texture and fresh taste, but was unimpressed by the piri piri butter sauce which was neither spicy nor especially buttery. 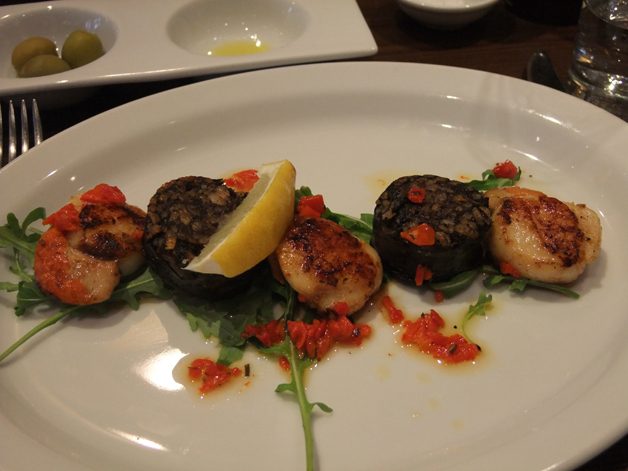 My own starter consisted of scallops served with black pudding. The scallops were fresh, but had been overcooked slightly so that they had lost their firmness and become too soft. Even so, they should have been well-complimented by the fatty slices of black pudding, except the black pudding here was surprisingly bland. At least the chopped peppers added a touch of sweetness to the dish. Disappointing. How can something that sounds so good on paper turn out so poorly in reality? 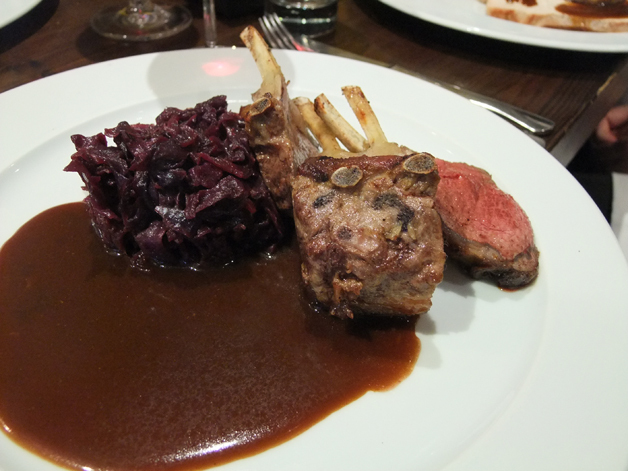 Mondeo Man opted for the rack of lamb served in a red currant jus served with braised red cabbage for his main course. Although the lamb was juicy, it was just lamb without any distinctive character and the surprisingly tasteless jus and cabbage did little to change this. It's been a rather mediocre season for lamb. NyanMaru was bitterly disappointed with his Christmas turkey. 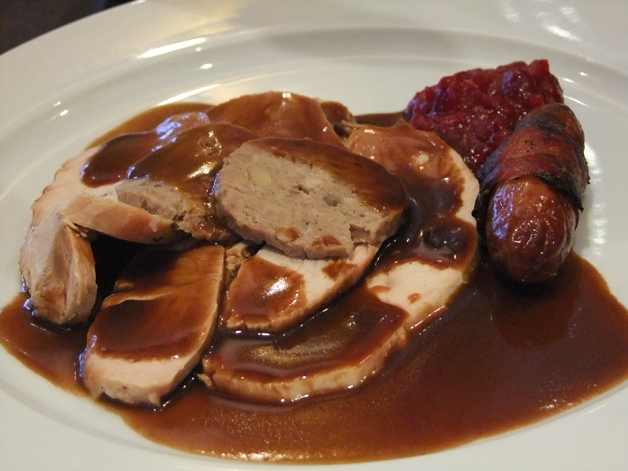 He thought that the rubbery turkey tasted microwaved, the vegetables were too soggy and the gravy was unexciting. At least he had a sausage wrapped in bacon as a consolation prize. I was also unimpressed with my own main course of wild rabbit. After savouring an initial hit of gamey flavour, the overcooked meat turned out to the far too soft, losing both the distinctively gamey flavour and firm texture of rabbit. 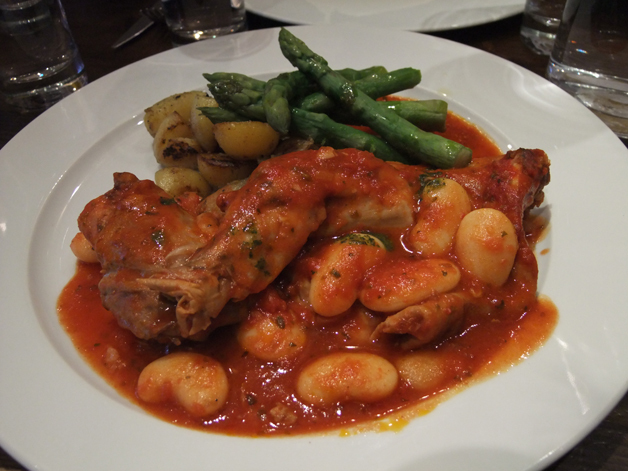 The asparagus was also far too soft for my liking and the tomato sauce was unremarkable, but at least the roast potatoes were crispy and the beans had a nice buttery nuttiness to them. 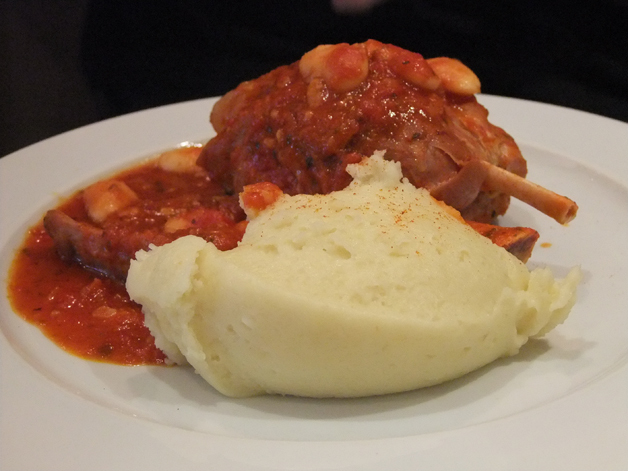 The Gunner had better luck with his choice of braised hock ham served with creamed mash, beans and vegetable ragout. Not only was the portion of pork absolutely massive, it was juicy and tender, falling off the bone. The beans and vegetable ragout were unexceptional, but the very creamy mash received his seal of approval. Hock if you like pork. 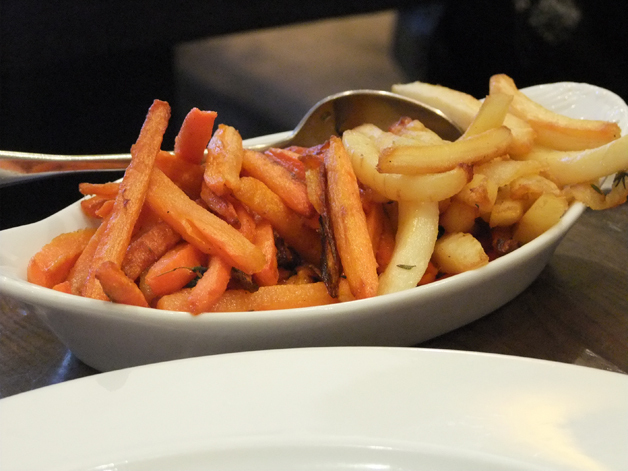 The side dishes were surprisingly enjoyable, sometimes even more so than the main courses themselves. The brussels sprouts weren’t too bitter and just the right amount of firmness, while the honey roasted root vegetables were sweet and not too stodgy. 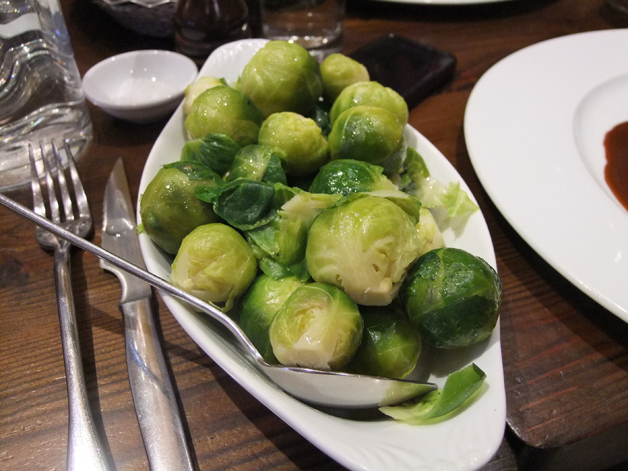 Does anyone eat sprouts when it's not Christmas? Let's get to the root of the problem. 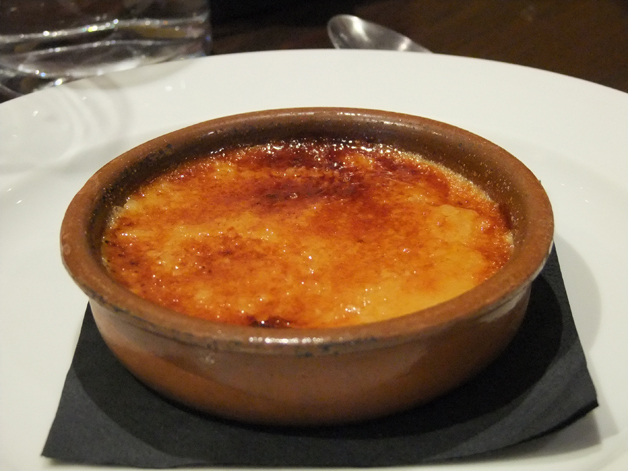 Mondeo Man skipped dessert, but the Gunner went straight for the creme brûlée which he enjoyed immensely. He approved of the crisp, caramelised crust and lapped up the creamy interior which wasn’t too watery. 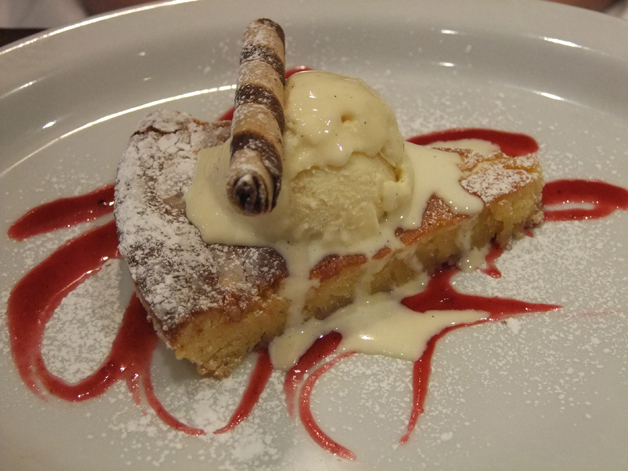 Both NyanMaru and I opted for the Spanish almond tart served with vanilla ice cream. While the ice cream wasn’t anything to write home about, the tart was surprisingly enjoyable with a coarse, large crumbed cake-like texture and a strong but not overpowering taste of almonds to it. Not bad at all. The food at About Thyme is unexceptional and for the most part feels more like safe, inoffensive pub food than inventive, finessed cuisine. It’s not bad, but unless you’re looking for somewhere to entertain doddery old relatives or a venue for a business lunch then you can do so much better in this city. Opening Hours: Monday-Saturday 12.30-14.30 and 17.30-22.30. Closed Sundays. Total cost for one person including soft drinks: £33-40 approx. Tags: almond, black pudding, brussels sprouts, cabbage, carpaccio, creme brulee, ham hock, hare, lamb, london, piquillo peppers, prawns, rabbit, restaurant, review, scallops, tart, turkey. Bookmark the permalink. After reading your review of About Thyme, need to have a strong morning coffee. do not recognise my favourite local on your review at all. peace and happy new year to you.